Iron Eagle Posing Trunks. Sharp cut, high quality fabrics. Fill out any custom requirements here i.e. back width, waist size etc. Iron Eagle Posing Trunks are fully lined on the front with breathable power mesh and produced using the highest grade, 4 way stretch, velvet fabrics for ultimate fit, comfort and durability. Iron Eagle Premier - The Premier Pro cut reveals the ultimate V taper, hits extra high up on your hips revealing those deep quad cuts. A super narrow cut back with a scrunch elastic to pronounce your glutes even more and reveal glute striations, pouch type front with centre seam and ultra thin side straps. Fully lined on the front. Recommended for pro competitors. Iron Eagle Flex - The Flex cut has a more conservative cut for athletes who require a more conservative look with a bit more cover on front and back. 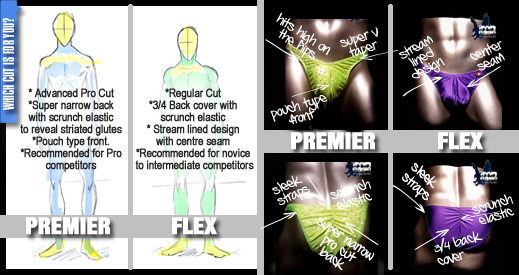 The Flex cut is fully lined on the front, has a 3/4 cut back with scrunch elastic to pronounce your glutes. It has a centre seam on the front and sleek side straps for a comfortable fit. Recommended for novice and intermediate competitors. * Most fabrics wash well by hand in a sink of cold water but extra care is required. The fabrics, specifically holograms,shattered glass & vinyls, are delicate and will begin to show signs of wear much faster than regular swimming trunks. * Use mild soap like ivory or hair shampoo.